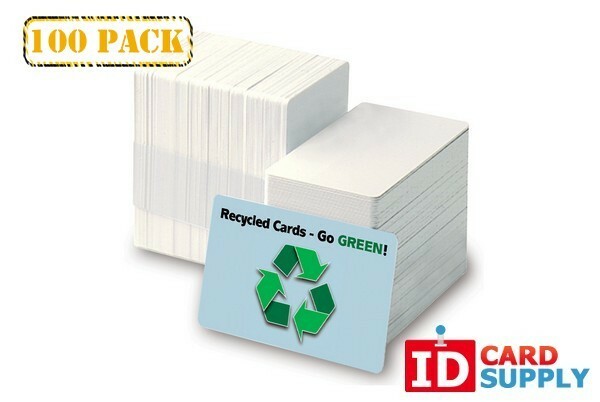 Pack of 100 Biodegradable Blank PVC Cards | Same Day Shipping from IDCardSupply! QTY: 100 | Standard White 30 Mil PVC Card with Vertical Slot Punch was added to your shopping cart. QTY: 500 | Standard White 30 Mil PVC Card was added to your shopping cart. 100 x 20 mil CR80 PVC Cards - White was added to your shopping cart. Standard White 30 Mil PVC Card with Horizontal Slot Punch | QTY: 500 was added to your shopping cart. Do you care about the environment as much as we do? These biodegradable PVC cards look, feel, and perform just like your normal PVC cards. Under everyday normal use, these will last you as long as one could want an ID card for. These biodegradable cards can be wet, stored in a wallet, be printed on and even UV-treated. The biodegration process only happens when the cards are in a fertile environment, which the microorganisms will decompose ( e.g., compost, trash, water, soil, etc). These cards degrade within 9 months to 5 years of continual exposure to microorganisms.